The following is the second half of the introduction to Starship Century available in print and ebook August 2013. The first part can be found here. The effect on science fiction (sf) writers mirrors this decline. Even before the first moon landing, English sf writer J G Ballard wrote nostalgic stories regarding the space program as a glorious folly of the 1960s. Barry Malzberg’s 1972 Beyond Apollo depicted an astronaut driven insane by the experience of an expedition to Venus. American writers’ optimism faded much more slowly. The 1970s saw a lot of space fiction, especially about living in habitats there. Many of the best writers, such as Arthur Clarke, Isaac Asimov (Foundation) and especially Robert A. Heinlein (Stranger in a Strange Land, The Moon is a Harsh Mistress) set epics in futures that assumed ready access to space. Over time, such settings became less common. 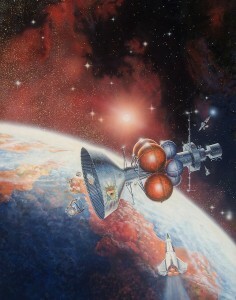 The “conceptual blowout” and frontier imagery of interplanetary exploration is now more often tied specifically to interstellar travel, as in Poul Anderson’s Tau Zero (1970), Vonda McIntyre’s Superluminal (1984) and Allen Steele’s popular Coyote series (2002). Now, science fiction is becoming more firmly economically based, because the history of post-1972 NASA has sobered the writers. The writers in this book do know the realities, and most have PhDs. They see that in today’s frugal climate, space is going commercial. A nuclear thermal rocket used only in space (a technology already largely developed), and resupplied with fuel by the launchers we have now, could open whole new industries. Some envision profitable businesses that could build a genuine interplanetary future re-powering of satellites in geosynchronous orbits, big spinning wheel hotels, asteroid mining, and more. Getting people into orbit may well best be done not with risky rockets, but with two stages – an airplane carrying a rocket plane, so takeoff is not on a Roman candle but on a runway. Despite the challenge, many now think our economic problems can be dealt with by using the resources of the solar system.. Such a development path could also open up means to begin exploring other stars, all within a century. This book looks at how this can be done. There is a deeper reason why thinking of starships now opens fresh horizons. By working through the technical steps for propulsion, habitat, motivations and more, we gain some perspective on how interstellar flight looks to alien minds which face the same physical problems. We live in a sparse outer part of our galaxy, and our star is on average about a billion years younger than similar stars elsewhere. In the vast hub of stars further toward the galactic center, distances between stars are shorter, and so travel is on average easier. Worlds there have had more time to develop space travel. Alien minds might have mastered the huge problems of such voyages long ago. This brings to mind an old question, due to Enrico Fermi: Where are they? Clearly any society, human or alien, that sends starships into the deep dark must be both very rich and very long lived. Our human experience shows that extravagances seldom exceed one percent of a society’s annual spending; the Apollo moon program grazed this limit. Interstellar ships will need vast energies and capital. Similarly, few human enterprises exceed a human lifespan to pay off. As we have prospered, so have we lived longer. Our average lifespan doubled over the last two centuries. As Robert Zubrin argues in his piece here, economic growth can be rapid and better than linear in time, as it has now for several centuries. This has enormous cultural impact; fields such as archeology and environmental concern require a long enough perspective in time to exist at all. So there is some hope that our future societies will see people who live well beyond 100 years and take the long view in their investments. Their societies would, too. Then they could see the point in such a vast dream as flight to the stars. Suppose we invert this argument. Fermi’s famous question—Where are they?—may imply that aliens do not live long and prosper, to quote Star Trek. If so, it may be up to us to do so, perhaps uniquely in our galaxy. This book may help thinking about the Fermi Paradox. More, it will place our era in a larger perspective, as a galactic presence on the threshold of greatness. Starship Century will be available in print and ebook format in August of 2013. Follow us on Twitter, Google+ , or Facebook for early readership opportunities and more. All proceeds from the book will be donated to starship research and development efforts. 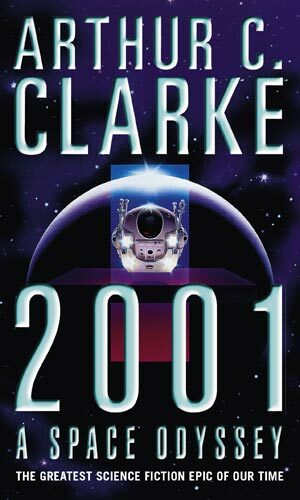 This entry was posted in Blog, Excerpts and tagged 100yss, Allen Steele, Arthur C. Clarke, Fermi Paradox, Geoffrey Landis, Greg Benford, Robert Zubrin, Science Fiction, starship century, Stephen Baxter by Gregory Benford. Bookmark the permalink.